What product do ninety percent of in-ground pool owners own? If you answered “a pool cover,” you are correct! Safety covers are not just a nice thing; they are a necessity! From preventing children, pets and wild animals from ending up in the pool, to helping to keep out leaves and other debris, pool covers can provide invaluable peace of mind. 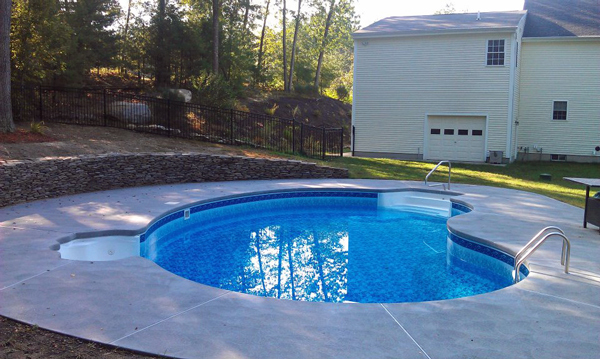 Safety covers are especially beneficial for in-ground pool owners, as their pools lie flush with the ground and are very easy for a young child or pet to fall into. Here at Daigle Servicing Company, we are proud to offer our customers high quality and affordable pool safety covers that will keep the pool as safe as possible. Although there are numerous types of pool safety covers, we install only the CoverLogix pool cover. Sometimes referred to as an “Elephant Cover,” we believe that the CoverLogix is the best pool cover that is currently on the market. One of the many things that help to set the CoverLogix apart from the competition is its double edged stitching. This helps to ensure that the cover is as strong and durable as possible, and if someone does wander on top of it, that it will hold in place and not rip. The CoverLogix pool covers come with wear strips around the coping edge, commercial grade springs, and a 12-year warranty. CoverLogix pool safety covers are also as attractive as they are functional. These self-draining mesh safety covers come in shades of blue, tan, gray or black. From October to May, your swimming pool lays dormant. Why not have it look its best then, too? Not only that, but to have the peace of mind knowing that the pool and people are protected from harm in those months you are not thinking about your swimming pool. Leaves, tree branches, will not end up settling in the water. The tight seal of a safety cover makes cleaning out and opening the pool that much less of a chore when springtime comes. At Daigle Servicing Company, we offer the most competitive pricing on an installed safety cover, as well as an unmatched commitment to customer service. We will match the shape of your in-ground swimming pool with the correct CoverLogix mesh safety cover ant install it securely. We never work with subcontractors when installing this important piece of pool equipment. 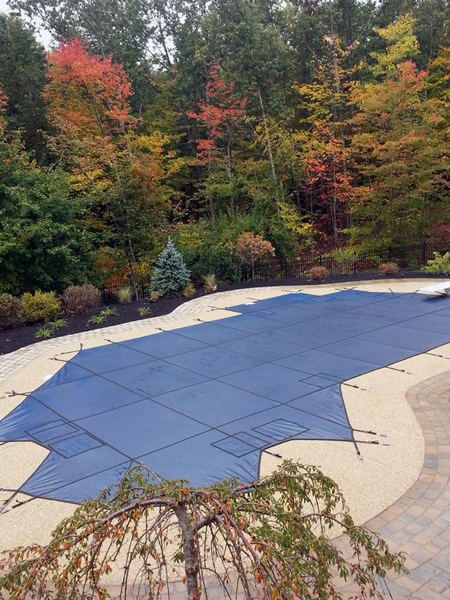 This means that instead of handing our customers off to other people who will install their covers for in-ground pools, our clients will work with us from start to finish. Our customers are truly number one with us. We pride ourselves in installing the best pool safety covers possible and keeping our customers’ pools safe and clean.